The MPhil in Public Policy (MPP) was launched in October 2013 with an initial class of 23 students representing nine countries. The MPP provides an interdisciplinary grounding in public policy theory and practice, with courses ranging from philosophy and policy analysis through to media and politics. It is aimed at those with some experience (2 to 5 years post graduation) who wish to develop their abilities to be policy entrepreneurs, either in government, NGOs or in business. The course is structured around four streams, each providing a different aspect of academic and practitioner understanding of public policy. 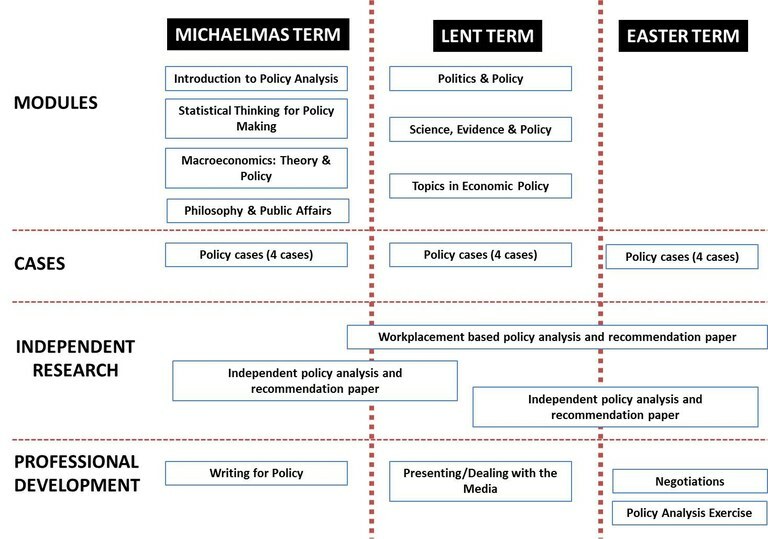 These streams (modules, cases, independent research and professional skills development) are shown below with the elements of the course as it is structured at present (2016 – 2017). By balancing academic foundations in public policy, policy analytical skills and a focus on doing work which is highly applied, the course aims to ensure that students are prepared to immediately work in a policy environment and to have impact in their areas of policy interest. Full details for the course, including how to apply, can be found on the Department of Politics and International Studies (POLIS) webpage here where more detail is given on each of the elements of the course.